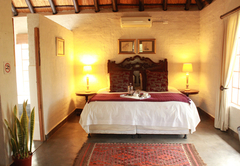 Shikwari Game Reserve is a 4 star graded game lodge offering Hoedspruit accommodation in 10 guest rooms. 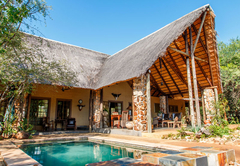 Set below the beautiful Northern Drakensburg Mountains; Shikwari Game Reserve offers two types of accommodation in two camps on a 200 hectare property. 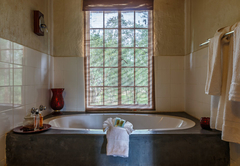 Enjoy the majestic views of the mountains and the tranquil peace of the bush. 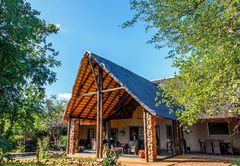 The reserve offers walks & game drives onsite and Big 5 Safari’s in an open vehicle Kruger Park with our resident FGASA guide. Or just kick back and relax around the pool . 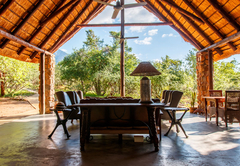 Shikwari with cathedral-like thatch roof; offers a fully licensed bar, lounge and dining room Also open to Pangolin guests for meals booked with accommodation and for use of the free Wi-Fi during the day. 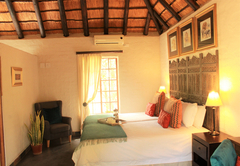 Six affordable luxury thatched suites. 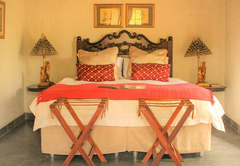 Each suite is tucked away in the bush and decorated with stylish furniture and luxurious textiles. 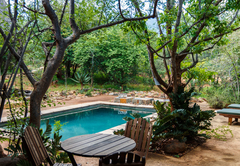 Relax on the open veranda taking in the view and cool off in the shady pool. Caring staff offer a home from home feeling; with friendly relaxed service in these amazing surroundings. 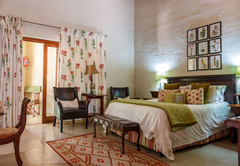 The six suites offer a choice of King or Twin beds both made up with fine percale linen. One of the five; The Wild Fig Suite offers a main bedroom with queen bed and a separate smaller room for children on bunk beds. It has a larger veranda & family bathroom with Victorian bath. 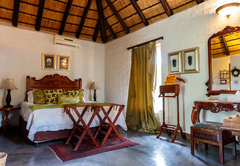 Each suite accommodates 2 adults & 2 children. They have a private bathroom and outdoor shower and sitting area plus a small patio. Opt for the half board meal plan and enjoy a delicious 3 course Dinner plus a full Continental & English Breakfast. Cuisine is a celebration of South Africa and its different cultures. Pangolin is the more budget option but no less comfortable. 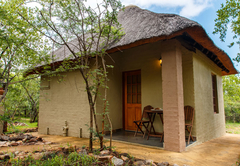 There are 4 traditional thatched round rondavels, two rondavels with a “Bush Bathroom” consisting of outdoor shower, covered toilet & basin. 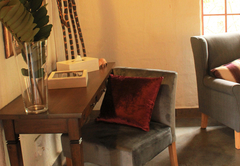 All rooms have a wardrobe, seating, & hospitality trays. 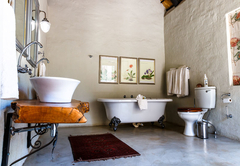 The other 2 rondavels share a bathroom with bath basin & toilet & an outdoor shower. 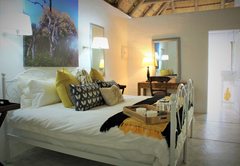 All beds are made up with luxury percale linen and towels are supplied. In most rondavel there is a choice of beds. 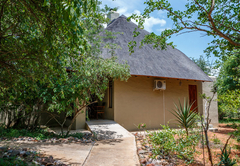 This comfortable rustic camp has a communal Kitchen that is fully equipped,uses for groups, a Lounge with Premium DSTV and flat Screen TV that all rondavels use. 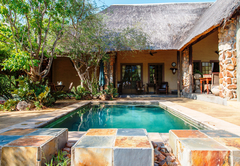 In the garden there is a pool and a boma Each rondavel has a choice of a king or twin beds, a wardrobe, dressing table, chairs and a small fridge with freezer, hospitality tray. 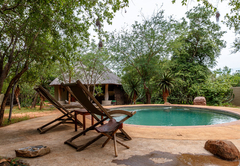 This rustic camp can be booked either individually or as a whole for a family get together or a group of friends giving complete exclusivity. Groups are able to request a self catering rate. Included in the luxury accommodation is a delicious 3 course Dinner and full Continental & English Breakfast. Cuisine is a celebration of South Africa and its different cultures and always served with love. 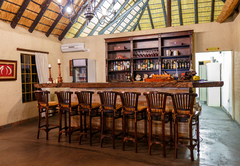 Meet for a pre-dinner drink and chat at our convivial Warthog Bar with other guests, before sitting down to a delicious three course dinner either plated or served buffet style on our veranda or in our well appointed candlelit dining room served personally by us. Our Chef might also do a South African braai (barbecue) on warm nights, in the boma around a fire. This brings one close to the sounds of the night and is an opportunity to see the wonderful night sky and stars. 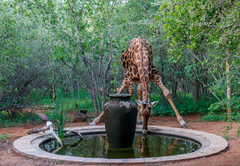 Guided Game drives and walks with a FGASA guide are available here at the lodge and to Kruger Park in open vehicle with a guide. 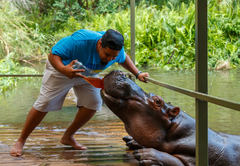 Our reserve is close to Kruger Park, Nyani Cultural Village, The Blyde Boat Cruise, The Panorama and Blyde River Canyon, Graskop Gorge and Lift, Jessica Hippo plus many other exciting sightseeing attractions for day trips. 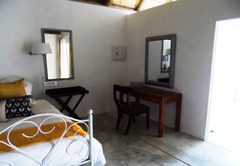 Choice of Twin or King bed,with private bathroom & outdoor shower. Children ages 10 - 12yrs only on request. 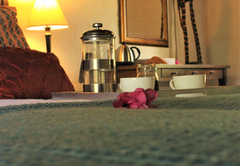 Bathrobes & Slippers, Mini bar & Hospitality tray with teas, fresh coffee & Homemade cookies Toiletries. Turn down service. WiFi at main lodge. 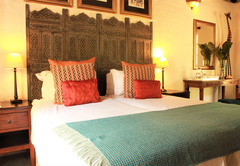 Choice of Twin or King bed,with private bathroom & outdoor shower. Fold out beds for two children ages 10 -12yrs on request Only.Bathrobes & Slippers Mini bar & Hospitality tray with teas, fresh coffee & rusks. Turn down service. Choice of Twin or King bed,with private bathroom & outdoor shower.Fold out beds for two children ages 10 -12yrs on request Only. 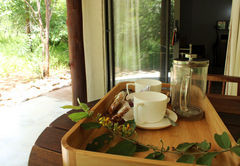 Bathrobes & Slippers Mini bar & Hospitality tray with teas, fresh coffee & rusks. Turn down service. 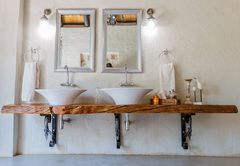 Choice of Twin or King bed,with private bathroom & outdoor shower.Fold out beds for two children ages 10 -12yrs on request.Bathrobes & Sllippers Mini bar & hospitality tray with teas, fresh coffee & rusks. Turn down service. Includes Dinner & Breakfast. 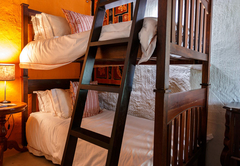 Accommodates 2 adults on a queen bed in main room & 2 children age 10-12 only on bunk-beds. 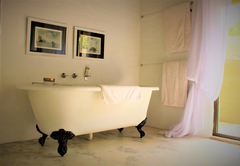 Large family bathroom with double sinks, Victorian Bath, Separate Indoor & Outdoor Showers. Minibar (Not Stocked) Hospitality Tray with coffee, cookies & Tea. Knobthorn Suite - King size wrought Iron bed. White percale linen, Hospitality Tray & Mini Fridge. A seating area .Two fold out beds can be requested for children age 10 to 12 years. 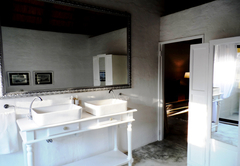 The large bathroom has double vanity, Victorian Bath & outdoor shower. Private Bush Bathroom. 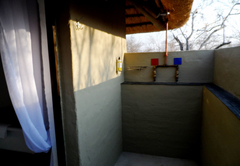 Outdoor shower, covered Toilet & Basin. 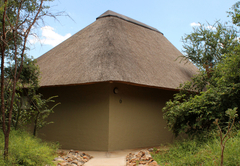 Aircon, King or Twin Beds, fridge/freezer, tea & coffee tray.Communal Kitchen & boma. Lounge with full DSTV & pool. Bring swimming towels. King Bed 2 adults & 2 children 2- 12yrs Ceiling fan, Small fridge, Small veranda Tea & Coffee maker, Shared bathroom, lounge and kitchen. Pool, Bring swimming towels. Free WiFi at Shikwari Suites Lounge 10am - 5pm. 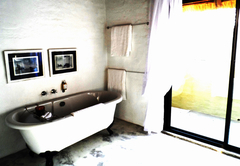 Shared Bathroom &- Outdoor shower, Toilet & basin. Choice King or Twin Beds 2 adults & 2 children 2- 12yrs, Ceiling fan, Small fridge, Tea & Coffee Maker, Shared kitchen & boma, lounge with Premium DSTV, Pool. Bring swimming towels. 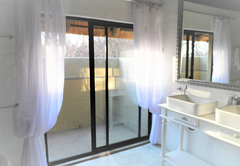 Private Bathroom - Outdoor Shower, toilet & Basin. 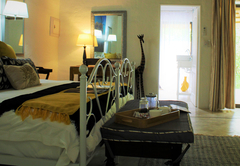 Twin or King Bed, Shared Kitchen, lounge with Premium DSTV & Boma, Pool - Bring own swimming towel. Response timeShikwari Game Reserve typically responds to requests in 5-10 minutes. Child policyChildren 5 years and over and older are welcome. After 17h00 arrangements must be made for a late arrival. Please note we do not accept check ins after 21h30. 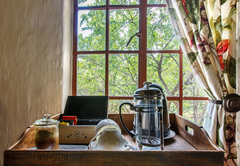 Exceptions to check-out times may be arranged if we do not have guests checking in that day, please enquire.